These photographs first appeared April 22, 2000. Send your photographs for inclusion in this rotating gallery! This very attractive Nauset migrated all the way from Massachusetts to Texas and the Gulf of Mexico. Getting a 34-year old boat into this condition required substantial restoration. 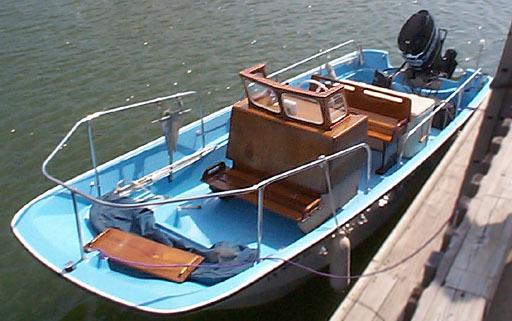 Acquired in 1994, the hull had sustained damage and the repair work was not good. In 1999, a bottom crack developed, ultimately tearing out a 1x12 foot strip of laminate all the way to the transom. "We were going to let this Whaler die at that time. However, the longer it sat in front of the house and remembering all the hours we spent on the wood, we decided to see if we could save it," writes co-owner Zack Troxel. A local fiberglas refinisher got the hull sound again, while Zack and partner Mike Hardick buffed out the interior. POWER TIME has some provenance. She was originally purchased on September 4, 1966 for $3,596.00, including a Tilly Trailer and Merc 950. In 1979 the engine was upgraded to a Merc 115 with power tilt/trim. I like the way the blue trim on the Merc coordinates with the interior blue gelcoat. 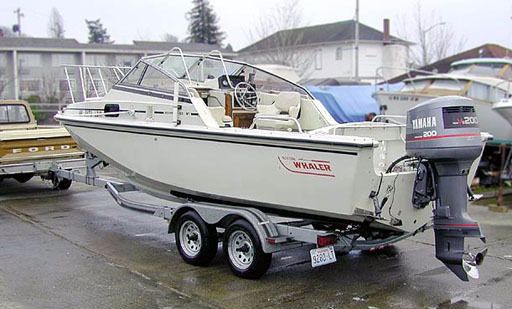 Most Whalers are open boats, but the Revenge series molded a cuddy cabin onto the sturdy 22-foot hull. The bow pulpit was optional. Aluminum Lewmar hatches have replaced the original plastic on the foredeck. The first question I had: Where's the flying top? Just removed as part of preparation for a Seattle winter, second owner Stacy Mohr says, "The top is up 99% of the time in this part of the country." 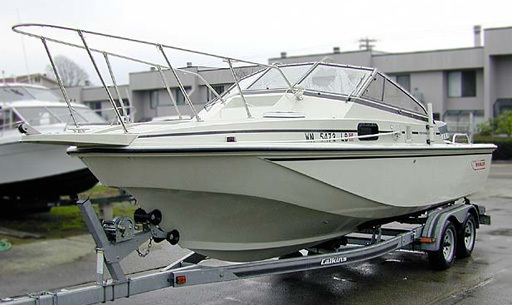 Calkins trailer and 200 HP Yamaha round out this package. 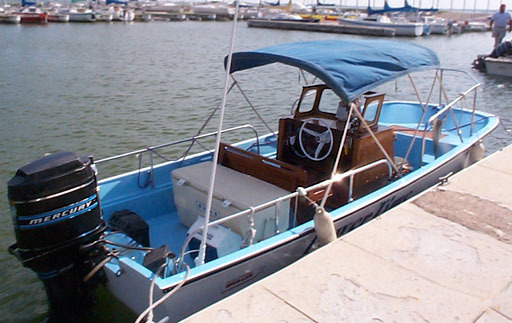 The Yammie replaced the original engine, a 175 Merc, which had the boat "underpowered." Top speed is now 45 MPH. Many of the originally wood elements--fish box cover, tunnel hatch, pole racks-- have been replaced with Star-board. These larger whale(r)s have evolved into deep-Vee hulls with almost vestigial sponsons, although the location of those trim tabs indicates they must still be in the water when on-plane.